A very popular model of motorcycle jeans TRILOBITE PARADO (and popular not only with the Czech customers) was given great media attention at the show. These pants have "celebrated" the acceeding the figure of 100,000 pieces sold worldwide this year! 100,000 satisfied customers from all over the continents who ride in Trilobite Parado motorcycle jeans and this is a really decent number. This product gets the highest number of reviews from direct users on all possible test and sales websites. 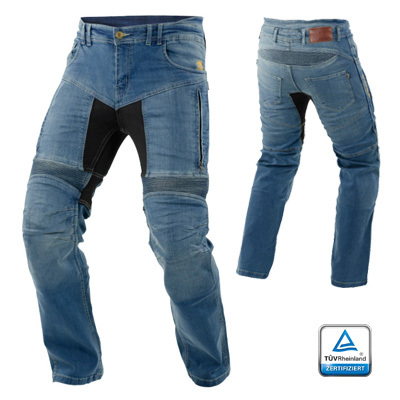 Among the manufacturers of motorcycle clothing, this is a unique record sales statistic that consistently proves that Trilobite Parado is exceptional among the other motorcycle jeans and is rightfully one of the best-selling brands in Europe. 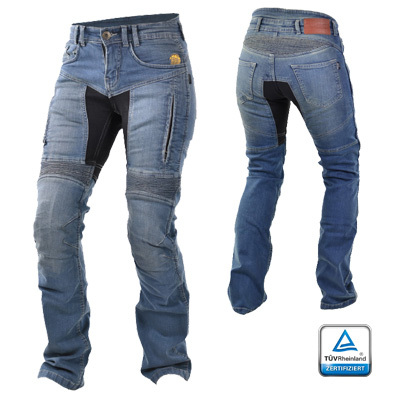 The Motojeans Trilobite Parado have a very specific cut and design that ensures that the pants fit perfectly to the vast majority of riders. High-quality aramid materials and protectors of own production´s label Level 2 have increased safety to the maximum, as evidenced by the TÜV certification itself. There are no similar pants on the Czech market that boast this very demanding and strict certification by the German Institute. This is why the Trilobite brand introduced other colour modifications of this successful model and two completely new versions. The first of these is the high-tech trousers under the name Trilobite PARADO DYNEEMA DENIM, which are made, as the name suggests, of Dyneema - an extremely durable fiber (15 times stronger than steel) based on UHPMW polyethylene with a thickness of only 0.8 mm. The other novelty is Trilobite PARADO RECYCLED DENIM, which is probably the first motorcycle jeans made of recycled denim. Nevertheless, the development department has recently worked on the recycling program very intensely. During the jackets production, it uses recycled polyester obtained from pet bottles taken from the ocean. Bearing in mind the increase of copying of products, the other novelties of the 2019 collection - there were 25 novelties introduced by this brand belonging to the parent company Bikers Crown – were shown only to invited business partners and selected journalists at a closed exhibition. Other presentations of the new collection were held in private for the dealers of local distributors in the markets and the American International Motorcycle Expo in Las Vegas. The official presentation of the Trilobite 2019 collection for the Czech motorcycle public is scheduled for the beginning of 2019.